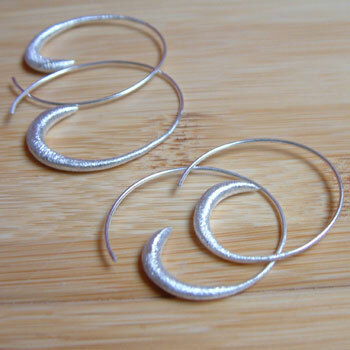 Bestselling Sterling Silver Sprial Hoops look great for every occassion. These are with a modern scratch-matte finish. The spiral is a very unique symbol spanning spirituality, mathematics and nature. Spirals are seen in diverse places from ancient celtic symbolism to chinese art and from spiral galaxy models to nautilus shells.